My review today is for A French Renaissance? 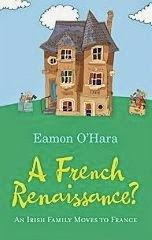 : An Irish Family Moves to France by Eamon O’Hara. I really enjoyed this gentle and amusing memoir about an Irish couple, Eamon and Tanya, who move to Brussels for work, become a family with the arrival of Ned and Astrid and decide to make a new rural home in The Lot, France. With their hearts set on the full fairytale French life, they find their modest chateau, with two towers and plenty of acreage, but even in the early stages their journey was not without a bit of heartache. I could almost hear Eamon’s lilting Irish accent as he took me with him to follow their dream, holding my hand to guide me through some of the more difficult situations they found themselves in. Their first few months of settling two young children into a new life, while coordinating building works to get the B&B up and running, and welcoming their first guests in the gîte, were more the stuff nightmares are made of, but an essential phase in the relocation process. As someone who has house-hunted in France with a pre-schooler, has experienced ear-splitting storms that come with rain so fierce it forces its way indoors and has had fun and games with local trades people, I could commiserate and/or laugh along. For those still in the dreaming period, hoping one day an idyllic life in rural France could be theirs; read this book, take notes and remember what you’ve read – you have been warned. I might envy him having a tower to write in, but knowing how much time and effort goes into mowing and maintaining our modest acre of orchard, he can keep his forty acres and his tractor, although I can honestly say I have never read such an emotional chapter about tractors. Ever! This is one of those memoirs where I have to ask – where did you find the time or energy to write it? Although, it was nice to read that they still made time, every now and again, to sit back and enjoy the beauty of their new environment. The Lot region really shines from his descriptions, so much so it made me want to plan a visit. You can see more information on staying with Eamon and Tanya at Laborie here. A French Renaissance? : An Irish Family Moves to France is published by Orpen Press and is available in ebook and paperback. Links to Amazon are below. You can read more from Eamon on Facebook and on his website.